Where’s my package? …IN THE ENDZONE!!! Finally, a play that works almost every time. 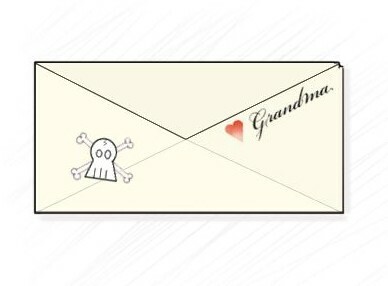 For this play there are three main positions which are the Grandma, the Mailman, and the Grandkids. The Grandma: This player should be a Handler comfortable with throwing a flick or backhand accurately long range. I put emphasis on the word “accurate” because it is not just a huck down field, it is a long-range pass that should go directly to a teammate. The Mailman: This player is the most important. They need to be fast and really good at cutting. Catching ability is an important aspect as well. They should also be able to throw short range with both flick, hammer, and backhand. He or she is the first man in the Vert Stack. The Grandkids: Three people that are not afraid to bid. They are the last three in the Vert Stack. This play starts with a Vert Stack, so be sure to know exactly what that is. The first man in the stack will be the Mailman and the last will be the grandkids. 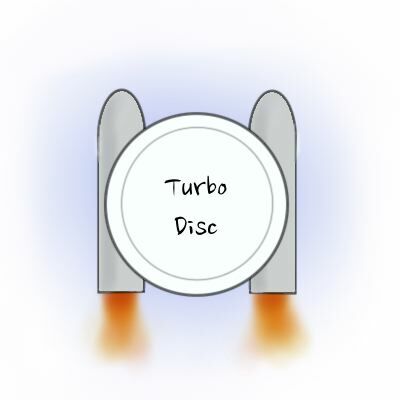 The handler, or Grandma, will pick up the disc as if they were running an ordinary Vertical Stack. Except this time the entire spotlight is on the Mailman. When the handler is ready the Mailman will sprint to the end zone. This is no ordinary sprint though. The Mailman should fully commit as if they were running a 100-meter sprint race (hard breaths, quick arms, no intention of cutting). The entire spotlight is on the Mailman on his trip to the end zone. Nobody else in the stack should be moving but they should look ready to go. It helps to confuse the other team if teammates yell “go deep!” or “end zone, end zone!” when the Mailman is running. The key is to make the Mailman’s mark 100% believe they are going deep. 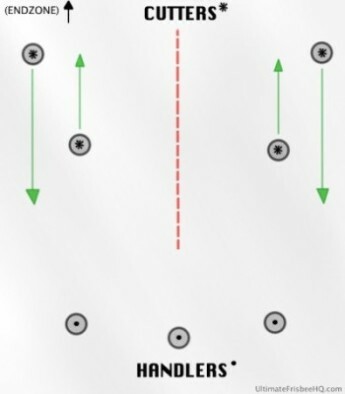 When the Mailman gets to the end zone line he/she will stop as hard as possible and in-cut towards the handler. Simultaneously, the handler should have thrown the disc while (or just before) the cut was made. 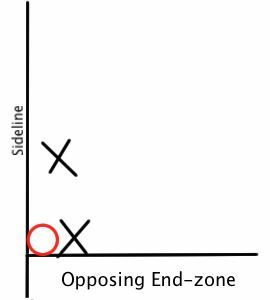 The handlers target should be about 20-35 feet before the end zone line in which the Mailman will be receiving it after his/her in-cut. Almost 100% of the time the Mailman will completely escape his/her mark if they fully committed before the cut. As the Mailman catches the disc the last Grandson in the vert stack runs as fast as possible to the back corner of the end zone closest to the Mailman. The second last in the stack runs towards the middle of the end zone and third to last runs to the far back corner of the end zone. The rest of the stack will come in for a dumps or swings for the Mailman. Ideally, the Mailman would throw the disc to the sideline of the end zone leading his/her teammate and scoring a point. This play works best when the opposing end zone is far away. I wouldn’t even attempt the Mailman unless you are on your half of the field. The main point of this play is to gain ⅔’s of the field off of a single pass. If the timing and throwing is right the full field pass almost always works. Sometimes the ending falls apart but that’s nothing a simple Ho Stack or a Vert Stack can’t fix. Confused on a couple Ultimate frisbee terms? Check out the full Ultimate Dictionary. Want to spice up this play with some sweet throws? Then All Frisbee Throws or Trick Shots is right for you. The Ultimate HQ may receive commissions from Amazon and Universe Point for some products posted on the site, these commissions are used to 1) Keep this site running 2) Cutting edge research on the latest dad-jokes and 3) To keep the Ultimate knowledge flowing. We thank you for visiting, stay chilly.